Raising-Rabbits is Two Years Old on November 17! Raising-Rabbits.com turns 2 on November 17! So we wanted to send a massive THANK-YOU to our visitors for hanging out with us. We appreciate you all, and really like hearing from you! You’re more than welcome, Arthur! That’s the whole reason we’re online...to help people raise rabbits. Angie from Wales, UK, gave us a shout-out just the other day. Turns out she thought she had 2 girl rabbits, but Miss Daisy turned out to be Mr. Daisy. And then there was suddenly a whole family of rabbits. Thankfully, Angie had discovered Raising-Rabbits.com, and managed the little crisis very well. You can read her cute story here. Try following our directions about sexing rabbits and see if you can't determine once and for all which is which. Are you sure you know all the rabbit predators in your neighborhood? Are you sure you’re not underestimating them? As we approach winter, food sources become more scarce. Hunger emboldens predators. It was about a year ago, in December, that raccoons attempted to break into a rabbit run. They were sorely coveting fresh rabbit for a midnight snack. Thankfully, our rabbits survived, although the raccoons did damage one rabbit's ear. We’ve gone all summer with nary a sighting of a raccoon, though we know a family of them lives within spitting distance of our home, just down an embankment toward a ravine. But two nights ago I went out on the back deck and down the stairs. 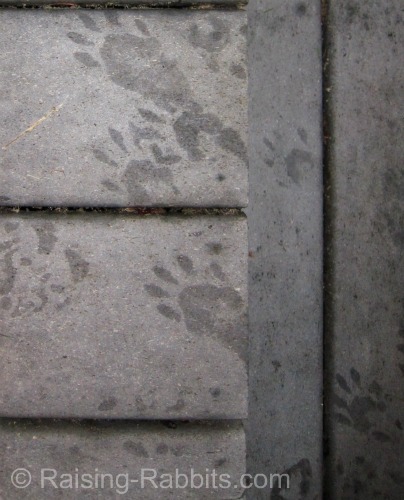 Low and behold - there were raccoon footprints on the deck and stairs. They had apparently come up to the sliding glass door, hoping to find a morsel of cat food unfinished by our cats. We can’t let our guard down for even a moment, if we want to keep all our livestock rabbits and chickens alive. What predators might threaten YOUR rabbits? "He started with four rabbits and a will to succeed. Seven years later, Samuel Agossou has built a home for his family and employs a dozen other young people in his business..."
This is how an article on helping youth entrepreneurs in Africa begins. Mr. Agossou lives in Benin, Africa. This article discusses the need for governmental and non-governmental agency collaboration to support the youth in developing countries, not only in Benin, where Mr. Agossou lives, but throughout Africa. Mr. Agossou has earned his right to an opinion. Why? Because after 7 years, he employs 12 young employees, and has raised a total of 700,000 rabbits thus far! My hat is off to Mr. Agossou! THIS is what will heal the nations - allowing and supporting the God-given freedom of individuals to earn a living. Mr. Samuel Agossou has done well enough that he can expand beyond his personal needs and bless others with employment as well. Your friends at Raising-Rabbits.com wish you a wonderful, if chilly, November. Copyright © 2009-2012 Raising-Rabbits.com. All rights reserved.